As a volunteer at the Monterey Bay Aquarium, opportunities occasionally come my way to do things that most people don't get to do. When the Monterey Bay Aquarium Research Institute (MBARI) offered tours of their Moss Landing facility to the Aquarium volunteers, I took advantage of the offer and spent an interesting hour and a half seeing the shops and labs and the R/V Point Lobos, the Institute's 110-ft research vessel with the Remotely Operated Vehicle (ROV) Ventana lashed to her deck. Our tour guide aboard the Point Lobos was one of the ROV pilots, Chris Grech, who explained what the parts of the ROV were, and took us to the control room below the Point Lobos' bridge. The control room has a dozen (or so) computer and television monitors and communications and navigation instruments, and the ROV control panels with joy stick and lots of buttons. Among the communications gear is a two-way television microwave link to MBARI which is forwarded to the Aquarium for the benefit of the visitors. Above the control room is the bridge with all the latest navigational instruments. I was very impressed with what I was shown, and enjoyed the tour. Occasionally, though, one makes one's own opportunity, and this time I thought I'd ask what it took to go for a trip on the Point Lobos. Chris told me to give him my name and phone number and he'd see what he could do. I gave him my business card and we continued the tour. When I got back to work from Memorial Day week-end, a month later, I found a message from Chris on my voice mail, saying that, if I could make it on such short notice, I could come out on the Point Lobos Thursday, May 28. I returned the call, saying I could make it; told my boss I was taking the day off and spent the rest of the day in an expectant state. Thursday morning, I got to Moss Landing at about 6:45, the boat being scheduled to leave at 7:00. I met Chris on board, and he introduced me to other members of the crew: the captain, Mark VandenBerg; Roger Hayes, the engineer; Bill Wardle, the alternate captain; and Jon Consiglio and Brian Ackerman. Later, I met the other ROV pilot, Jim McFarlane and the scientists, Dr. Bruce Robison and Kim Reisenbichler. Two undergrads from Hopkins Marine Lab were also along, Jenna and Annie (I didn't get their last names). It turned out that their projects had high priority on this particular dive. The Point Lobos left the dock at about 7:30 and from the harbor mouth took a heading of 240° towards an area off Point Pinos. During the ride out, Bill gave me a safety briefing and I got to know most of the other people aboard. About an hour later, we arrived at the area we were going to explore and preparations were made to launch the ROV. The straps were removed and the crane lifted it off the deck and out over the water. Chris donned a belt-mounted controller and when the ROV was lowered into the water, drove it away from the boat and evaluated its performance. It seemed the Ventana was slightly negatively buoyant (it would sink if left alone) and this is an unacceptable condition. If power were to fail, or the cable break, MBARI would like their ROV to come back to them. The vehicle has a flashing strobe and a radar reflector to enable it to be located in case of such an accident. The ROV was recovered and several kilos of lead were removed before it was relaunched. As the cable was paid out, bright orange floats of a non- compressible foam were placed around it at intervals of several meters. Chris piloted the vehicle away from the boat and started its descent. When it was out of sight, Jim, who was already in the control room, took command and Chris removed his belt control. The scientists and I repaired to the control room to see what there was to see. There are two video cameras on the front of the Ventana, one color and one black-and-white. There are large, bright lights surrounding the cameras; necessary, since it very quickly gets too dark to see. As the ROV descended, the lights reflected off the particles in the water. (As a diver, I would have estimated the visibility at about four meters.) The stuff in the water looked like a snow storm, and, in fact, the scientists refer to it as "marine snow." It is composed of living zoo- and phytoplankton and detritus from dead plants and animals and their waste. From time to time, Dr. Robison would talk into a microphone, identifying a plant or animal he saw. Most of the creatures seen were of no interest to the others, being commonly seen, though I would have liked to stop and look more closely. Some of the small mid-water shrimp were beautiful to look at. We finally stopped when we came across a large jelly, apparently of a species one of the Hopkins students wanted to collect. Unfortunately, this one was too large for the collecting jar, so we continued with the dive. Suddenly we spotted a small, brightly reflective fish. This is an animal, that if it were the size of a salmon, would discourage me from getting in the water. Being about 6 cm long, it had a head about 1 cm. It's teeth, however were oversized. The lower teeth curved up, outside the upper jaws and over the fish's eyes. It looked like fish I had seen in books called a viper fish. After studying it for a while and taking a few still photographs, Dr. Robison decided he wanted to collect it. The method of collecting was with a jar called a detritus sampler. About 15 cm in diameter and 20 cm tall, four of these are firmly fixed to the ROV. They have lids on top and bottom, swiveling to open and close. To put anything into these samplers, the pilot has to maneuver the entire ROV to bring the sampler down around the subject being captured. This is done with only a view through the main video camera (not binocular vision). Jim slowly moved the sampler down toward the viper fish. Just as he was getting close, the fish turned and darted away. Jim shoved his joystick forward and chased after the bright speck that was the little fish. The fish stopped and we caught up with it. Slowly, the detritus sampler moved down and surrounded the viper fish. As soon as it was fully inside the sampler, Jim pushed the button to close the lids. We all applauded his efforts, and when we looked up at the MBARI link monitor, we could see people in the conference room, also applauding. The tension generated by the chase was over and suddenly I was aware of the something else. I had been sitting for an hour and a half in a darkened room aboard a boat that was moving at the whim of the sea. Not only were we not anchored, but occasionally the captain kicked in with the engines to alleviate any potential extra tension on the tether. Meanwhile, the seas and swells were moving the boat up and down, side to side and forward and aft. The boat was also pitching, rolling and yawing. An announcement over the boat's P.A. system told us that a school of Dall's porpoises was swimming around the boat. I used this as an excuse to leave the control room. I made it to the rail in time to deposit my breakfast over the side. I turned around to see the boat's crew smiling sympathetically. They assured me that almost everyone was affected that way the first trip out. (I have since learned that among the researchers and students, the boat is sometimes known as the Point Puke.) After wandering around the boat for a while and consuming about a third of the boat's supply of saltine crackers, I returned to the control room for more viewing. A short while later, an orange, fuzzy rope came into view. 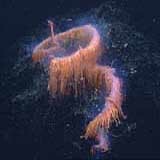 This was a siphonophore, a colonial cnidarian, a relative to the Portuguese man-o'-war. The fuzziness was the animal's stinging tentacles draped down to capture its prey. It was arranged in a helical coil until we disturbed it. It uncoiled slowly, possibly as a result of the ROV's impellers. Dr. Robison found it very interesting, especially the spatulate shape of some of the tentacles. Again, after viewing it for a while, it was decided to collect the specimen. This time, they decided to use the suction tube. Jim moved the nozzle of the tube in front of the animal and turned on the suction pump. The siphonophore was slurped in. Much easier than the other method. However, when we looked through the camera viewing the collection jars, the specimen showed up in pieces. I left the control room again at this point and had some more saltines. I sat down in the galley and the next thing I knew it was two hours later. My mal de mer had put me to sleep. I was very disappointed in myself, and returned to the control room to find the mission was completed and the Ventana was already back up to about 50 meters. The ROV had reached a maximum depth of about 900 meters. The two students had collected two or three specimens apiece and I had totally missed the uplink session to the aquarium auditorium. The ROV surfaced and was recovered in a reverse of the launching process. Once it was securely lashed to the deck the Point Lobos headed back to Moss Landing. When we reached the dock, the scientists and crew declined my offer to help in the clean-up and specimen handling, so I expressed my thanks and headed home.